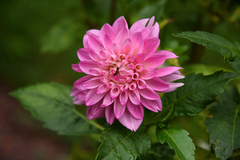 We are fond of dahlias at my house. 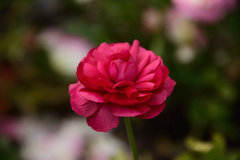 This summer we had some unusual varieties. They started out looking fairly normal, but as the summer progressed they took on some very different shapes. I used my wonderful cameras, the Nikon D800, D810 and my new D850, to capture those shapes. Here they are, in their glorious strangeness. 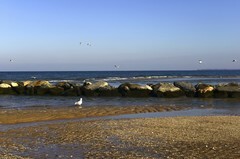 Tobay beach is an ocean beach on the barrier islands of Long Island. Among the dunes goldenrod grows in profusion, and so there is a patch of it growing next to the boardwalk at Tobay. 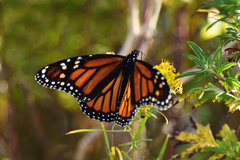 On this October day I encountered dozens of monarch butterflies happily feeding on the goldenrod's nectar. It was a beautiful sight. 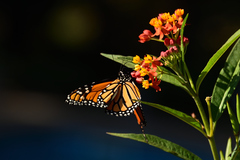 If you want to help save the monarchs, plant milkweed in your yard. They will come! A gift from heaven. 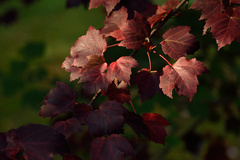 I made my annual visit to this Brightwaters community to capture the autumn leaves. I think these pictures are the best ever, so I just had to put them in a gallery. Enjoy them! These are pictures of the lovely flowers growing in my garden. The colors are particularly vibrant this year which makes them unusually beautiful to photograph. Enjoy them! 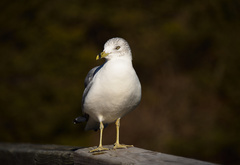 As you may have guessed, gulls are a favorite subject of mine. On three occasions I captured these portraits that show what fascinating and beautiful creatures they are. Over the years I've had some great photos that I haven't shown in other galleries. I've collected them here as an assortment of my favorites. Enjoy them! 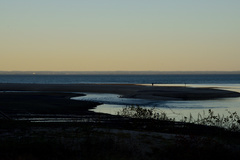 I got some interesting pictures of the Long Island Sound at dusk on this November day in 2016. As darkness falls, the growing shadows produce beautiful shapes and reflections in the water. The mood changes with the changing light. I thought I'd share a few of my favorites with you. 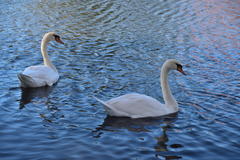 In this year's Brightwaters visit I had four encounters with a pair of swans. At first, I disturbed them and they became annoyed, giving me some dirty looks as they moved away. In the other encounters, they accepted me when I returned several times to take these lovely photos. Swans mate for life, and these pictures show an intimacy between this pair that is very special. Gulls are endlessly fascinating. They go about their business constantly hunting for food. On this beautiful day I was there with my camera to capture the moment. 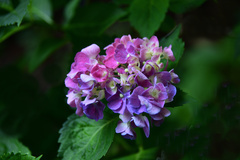 Hydrangea flowers are so pretty with their big colorful heads. You can get some very interesting pictures when the blooms are first opening. I hope you find these photos as pretty as I do. 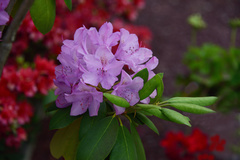 Rhododendron flowers look quite elegant when photographed up close with my wonderful new Nikon D810. Though they're all the same when seen from a distance, each one is unique when seen by itself. Enjoy the view! 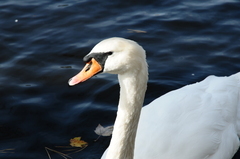 If you are captivated by the beauty and elegance of swans, then this gallery is for you. I've gathered my favorite swan photos to look at and enjoy. Just swans! This winter of 2015 has been a very hard one, with frigid temperatures and constant snowfalls. All this snow has created many beauties, especially at Crab Meadow Beach on Long Island. Here are a series of photos of our lovely coastal waters bound by snow. The Long Island Sound seldom freezes. 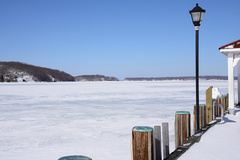 You might see Northport Harbor or some local ponds frozen up, but not the open sea. Until 2015, that is. This year's historic lows caused the Sound to freeze up to several hundred feet from shore. You look at the ice floes and expect to see arctic seals sunning themselves. I was awed at the beauty of it. 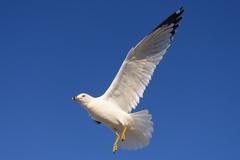 If you watch seagulls flying you realize what beautiful birds they are. 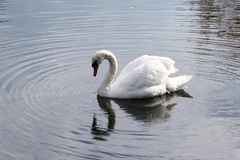 As they ride the wind currents, they are elegant and graceful. Being everywhere, they go unnoticed; their beauty hides in plain sight. In these photos, I caught their elegant beauty for all to see. 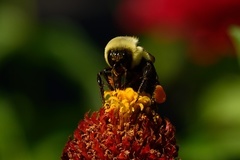 I love watching bumblebees going about their daily work. It is a short step to photographing them at it. They are fascinating and beautiful creatures, and I am happy to share my pictures of them. 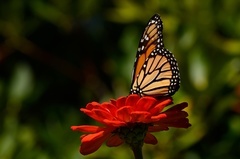 Three times in September of this year 2014 I was graced by the visit of some monarch butterflies to my zinnia patch. Each time the one visiting that day allowed me to fill my camera card with pictures while it enjoyed the nectar of my flowers. Here are some of the photos I got of these beautiful creatures. 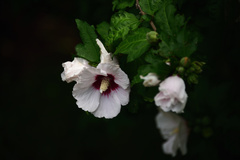 Rose of Sharon are among the most photgenic of flowers. They were so pretty this year that I just had to put up a gallery to show them off. These were taken this July of 2014 with my wonderful Nikon D800 camera. Enjoy them! 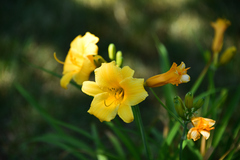 Day lilies grow everywhere here on Long Island. 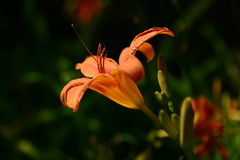 They are very elusive flowers to photograph, often keeping their beauty a secret. I was thrilled when these came out exceptionally well over several sunny summer days recently. 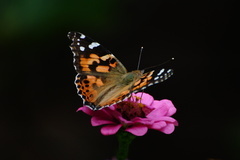 One summer day a flock of Painted Lady butterflies appeared in my zinnia patch and stayed for over a month. I had many opportunities to photograph them in their candid moments. Here are some of my favorite pictures. This year's spring flowers were lush, vibrant and plentiful. 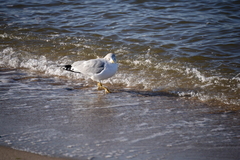 I captured these photos with my Nikon D800, and hope you enjoy viewing them. I visited Crab Meadow Beach on a cold December day. 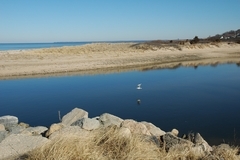 It was hight tide, and the creek at the eastern end of the beach was especially beautiful that day. I captured these lovely photos with my new Nikon D800 camera. I hope you enjoy them as much as I do. Sometimes amazing things happen. 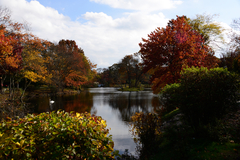 I went to this lake to photograph foliage one day in late October of 2010 with my new Nikon D300s camera. I also had my D70 along, and used it too. I was immediately converged upon from every direction by the birds in these photos. They came for a visit and let me take over 150 photographs of them, and they did not leave until I thanked them and said goodbye. Here are some pictures of that special afternoon. 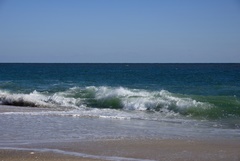 I've lived on Long Island all my life and have never seen the water the color that it was on this February day in 2009. These photos are not filtered in any way. They don't look real, but they are! I call them my extraordinary beach scenes. 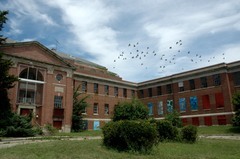 As you walk the grounds of this derelict hospital the profound silence speaks. You can picture the bustling life that once existed here. You can feel the sadness that surrounds all these dead buildings as you think about what went on inside them. But then you notice the beauty that lives here, too. I've tried with these pictures, taken in July 2007, to capture both. 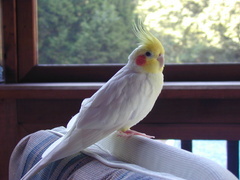 Arrow is the world's most beautiful cockatiel. He is a part of my family and my dearest friend. In Memoriam 1989 - 2007.